Possibly New Zealand’s most exclusive address, 54 Twin Peak View sits within Wyuna Preserve, an exclusive gated community 30 minutes drive from Queenstown, New Zealand. The private and secure Twin Peak View home is housed on one of only 34 outstanding parcels of land in Wyuna Preserve, a simply breathtaking development that will never be repeated in this area. The Preserve has views over the world famous Blanket Bay Lodge, and onsite features include a luxurious clubhouse with full chef's kitchen, boat house for owners use, and trout filled Lake Fyfe for fishing. Twin Peak View was designed by New Zealand’s oldest architectural firm Mason & Wales, and construction was completed on the international standard property in 2013 by with the project team lead by Triple Star Management, who are responsible for some of the finest homes in the South Island. Bas Smith, principal of Ray White Queenstown is selling the home, which had an unlimited budget on the interiors and fittings. “The residence is over 1000m2 on 3.01 ha, with four lodge scale bedrooms, four and a half bathrooms, executive office, eight car garage, games room, industrial style lounge bar, multiple dining spaces, cinema, and wellness area including a steam room,” Mr Smith told WILLIAMS MEDIA. The home won a housing award in Institute of Architects (NZIA) Southern Awards in 2018. 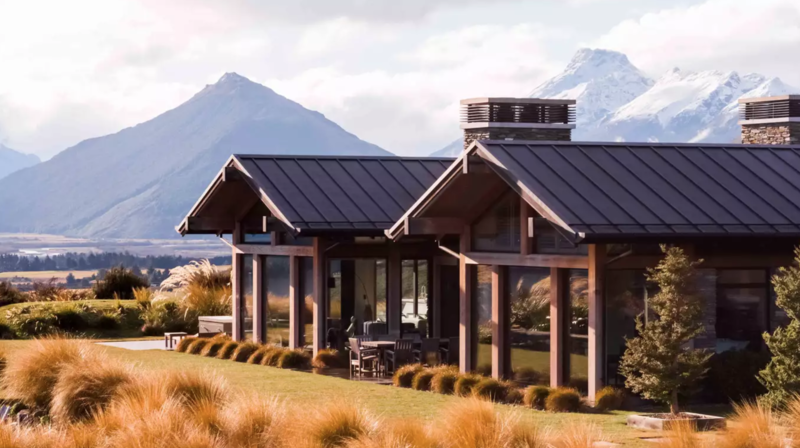 “Successfully sited, the house balances living spaces that open to breathtaking vistas of Lake Wakatipu with private, inward-focused space that have been pushed back into the site. According to the designers, Mason & Wales Architects, the residence was created as a homage to Blanket Bay Lodge, and resulted from a collaborative approach with the project manager, builder and project team. Hamish Muir of Mason & Wales told WILLIAMS MEDIA the clients brief evolved to personalise the interior, and be a world class property that fits into its surrounding environment. The home is clad externally with local schist stone quarried from the site, articulated with concrete, and hardwood timbers. Windows and doors are triple glazed in high performance aluminum frames, and the tray roof is zinc which will patina naturally and last for decades. Interior materials and finishes include schist, concrete, bluestone and solid oak panelling to floors, walls, doors, and ceilings combined with considered steel and plaster / concrete detailing of consistent scale. Mr Muir said the “most satisfying aspect of the home is the way that everything seems to come together to create an integrated and authentic property, extending from landscape, to the external envelope into the interior spaces, and continuing into the furniture, fitout and equipment”. Twin Peak View featured on the cover of Urbis Design's 20th anniversary issue, with a multiple page spread.